Contained within this mesmerising marble case is everything you need to achieve a completely flawless canvas. With five creamy colours to camouflage redness, brown spots and dark shadows, this also stars finely-milled brightening powders to create a beautiful, 'diffused' effect. The ultimate foil for uneven skin, this palette showcases the complexion-perfecting properties of colour-theory to brighten dark circles, counteract redness, neutralise dark spots and dispel sallow undertones. 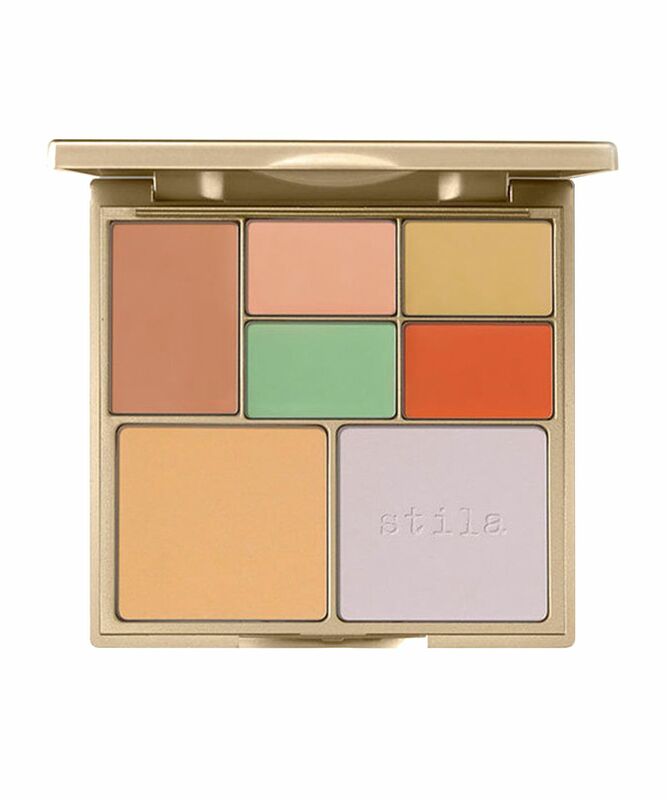 With five velvety-textured creams to correct imbalance and create a uniform base for make up – peach and orange for dark circles (fair and dark skin tones respectively), yellow for pigmentation, pink for under-eye shadows and green for spots, veins or rosacea – this comprehensive edit makes it effortless to customise your coverage. Two tinted setting powders then ‘fix’ everything in place while creating a ‘soft focus’ effect (think ‘real life’ filter for your face). Long-wearing and crease-resistant, the palette comes complete with user-friendly guide to take the guesswork out of gorgeousness. This palette comes with a step-by-step guide to colour-correcting - complete with a face map and explanation of each cream/powder's purposes. 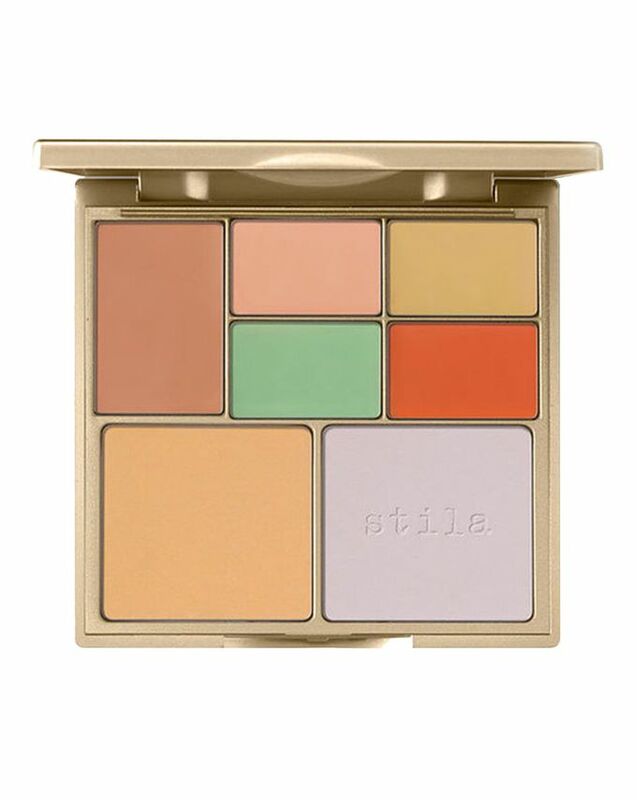 Refer to the colour correcting chart to determine which shade suits your specific need. Using your finger or a brush, apply sparingly to the imperfection until the area is neutralised. Follow with your favourite Stila foundation and concealer. For added correction, 'set' with the yellow or lavender finishing powders. Talc, Lauroyl Lysine, Zinc Stearate, Polymethyl Methacrylate, Octododecyl Stearoyl Stearate, Nylon-12, Silica, Phenoxyethanol, Mica. (+/-) Iron Oxides (CI 77491), Ultramarines (CI 77007), Yellow 5 Lake (CI 19140), Carmine (CI 75470), Manganese Violet (CI 77742). Caprylic/Capric Triglyceride, Octyldodecanol, Mica, Euphorbia Cerifera (Candelilla) Wax, Copernicia Cerifera (Carnauba) Wax, Jojoba Esters, Polyethylene, Disteardimonium Hectorite, Propylene Carbonate, Retinyl Palmitate, Tocopheryl Acetate, Ascorbyl Palmitate, Montmorillonite, Illite, Dimethicone, Kaolin, Phenoxyethanol. 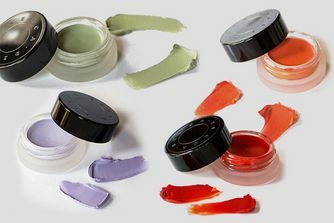 (+/-) Titanium Dioxide (CI 77891), IRON OXIDES (CI 77491, CI 77492, CI 77499), Yellow 5 Lake (CI 19140), Chromium Oxide Greens (CI 77288), Blue 1 Lake (CI 42090), Red 6 (CI 15850). *Contains Carmine as a colour additive. I have bought this palette over a year ago and it was sitting in my drawer until I rediscovered it recently..and I just love it! Now that is winter, redness is showing more as well as dark circle on my medium-light skin. I use mainly the peach cream under the eye to cancel any blue tone and the green one around the nose area and chin to cancel redness. This product is to use as a base in order to correct and not conceal, it works wonder under a foundation. I think it is probably more efficient on lighter skin tones because the colour in this palette are not so vivid so they might not be suited for someone who has heavy dark circle on a darker skin tone. The powders are OK too. The concept is great for example everything in one place, mirror and a plastic screen that keeps the powder and creams from mixing (so for practicality it's a 5* product). However, the pigmentation within the creams feels light (apart from the dark orange). For example with the green shade if you apply with an artis brush and blend with a sponge it vanishes completely leaving the blemish totally visible. Same for the yellow shade. The pink and lighter peach creams are better, but it's marginal. As for the powders they are OK but again I use them more for shine reduction and didn't get much of an uplift from the purple powder, the yellow powder is a little too dark for my skin tone (which is fair) and therefore have barely used it. In summary; for me this is a helpful touch up palette if travelling and brilliant concept but would like longer lasting and more highly pigmented creams with a lighter yellow powder before I would re-purchase.